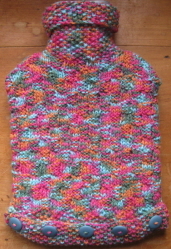 This textured hot water bottle cover is knitted in a simple, but effective, basket stitch pattern. 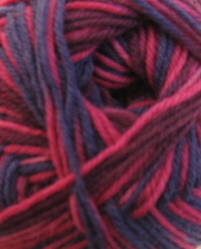 Shown here knitted in New Zealand Print 046 but suitable for any aran weight yarn. It is knitted on 4.50mm needles and you will also need 5 buttons. 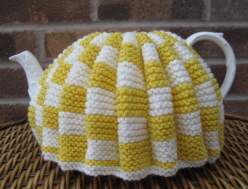 The pattern for this traditional tea cosy is adapted from a pattern in a booklet called The 'Greenock' Handbook produced by Fleming, Reid & Co. Ltd. There is no date on the booklet but it cost 3d when new so must be fairly old. Nevertheless, this style of cosy is very much in vogue - a similar one was used in the recent Paul Smith advertising campaign. The cosy is knitted in Millamia's Naturally Soft Merino but the pattern is suitable for any dk yarn. It takes 2 x 50 g balls of each colour but only uses a little of the second balls so you'll have wool left over for other projects. 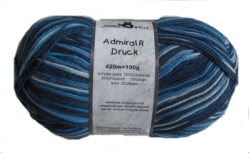 Alternatively, mix and match colours to use up yarn from your stash. It is knitted flat on 4.00mm needles.